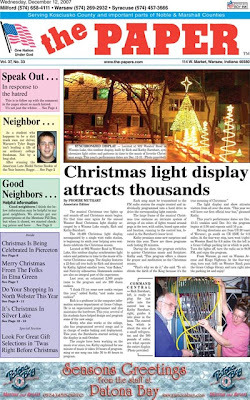 The annual Christmas light show at the home of Richard and Kathy Barnhart in Winona Lake, Indiana, is once again front-page news of a local paper. The Paper (pictured) currently features them in a lead story. The Barnharts are both employed by Grace College, and their home is directly across from Alpha Hall on the Grace campus.